My grandmother, Muriel Bush, was the Auntie Mame of our family. If that reference doesn’t hold water with you, consider the movie’s best quote, “Life is a banquet, and most poor suckers are starving half to death. You’ve got to live, live, live!” Grandma lived far, she lived wide, she laughed and golfed and ate and danced and sang her way through my childhood, peppering her adult life with exotic travels she never could have imagined as a young woman whose mother died when she was little and whose father’s second wife rejected her completely and shipped her off to live with two madcap, spinster aunts. I can remember her bawdily belting “Open all the windows, open all the doors, let the merry sunshine iiiiiiiiiiiiiiiiiiiiiiiiiiin!” as she prepped the kitchen before one of our improvisational cooking sessions, and I remember her bringing back various hats, jackets, cookbooks, cooking vessels, and taste sensations from her adventures all over the world. Earlier this month, I attended a trade show for my company in Amsterdam, The Netherlands. I don’t know in what year Grandma had visited Holland, but I do remember brightly painted wooden shoes and tiny, tinkling, blue Delft windmills adorning her home. As I walked around the gorgeous city, buzzing with bicycles and criss-crossed with canals, I felt Grandma’s presence, and knew she was happy I was experiencing one of her favorite places. 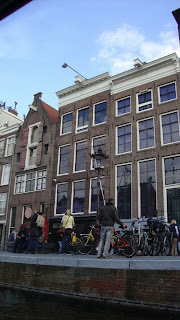 Nowadays, Amsterdam is maybe a little less famous for windmills and delft, and more so as the debauchery capital of Europe. Just as Americans flock to Las Vegas for an escape from decorum and tedium, Europeans, Asians and Middle Easterners alike seem to flood Amsterdam to visit the Red Light District and marijuana-laden coffee houses guilt-free. While I avoided the prevalent coffee houses dotting most blocks in the city, our little group did wander through the narrow alleys of the Red Light three times during our stay, marveling at the curiosity of mostly beautiful, well-groomed women displayed in crimson-lit windows, waiting for anyone with 50 euros to start the bidding. I heard that the city has had quite an issue recently with German teenagers coming in to party on the weekends, and driving home in the middle of the night higher than the Alps, only to crash their Peugots and BMWs on the way, and that sanctions may be coming on tourists’ use of the coffee shops’ wares. But that kind of worry was neither here nor there for our group, who were in town to work. The naughtiest things we enjoyed in Amsterdam were some mighty tall Heinekens. Home base, and a very nice one, indeed, was the Marriott Amsterdam, in the Leidsestraat neighborhood of the old city, adjacent to the museum district. Located across the street from a square that marks the entrance to one of the city’s most bustling shopping districts, the Marriott has a posh executive lounge and clean, modern rooms with black-out curtains that velcroed closed so light couldn’t sneak in. I was quite comfortable there for our four days in town. 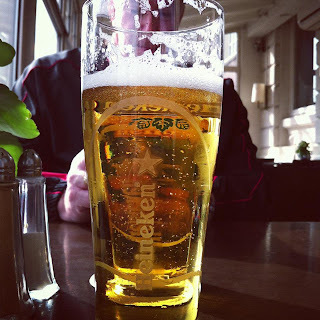 We sampled a lot of international cuisine in Amsterdam, very little of it actually Dutch. And I’m sorry, but pickled herring is just something this girl isn’t keen on chowing down. But something the Dutch have in common with the Swedes are open faced sandwiches. A breakfast and lunch staple whose most common iteration is brown or white bread with a couple thin slices of very good ham, a layer of slightly melted Swiss cheese, with a sunny-side up egg on top, these sandwiches are served in most cafes across the city. 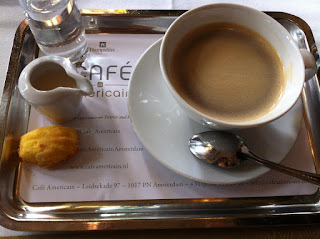 My favorite was at Café Americain, located in the American Hotel, which is kitty corner to the Marriott. The American Hotel is a landmark, built in 1900, and houses “Amsterdam’s living room,” which is how locals refer to Café Americain. My colleague D and I enjoyed lunch there our second day in the city, and tried to take the larger group back for a dinner, but couldn’t score a coveted reservation. At the café, I took in the gorgeous architecture, but also one of the top five cups of coffee of my life, and a pretty tasty sandwich. Each cup of coffee was hand-pressed, with that delicious topping of crema that you only get from hand-crafted brews, and served on a silver tray with a small pastry and a shot glass of water in case you can’t handle the java. You’ll see how scrumptious the sandwich was, given you fancy eggs. I do, very much, and this should be a dish featured on more American brunch menus. Simple, clean, delicious, with all the decadence coming from the runny, rich egg yolks and salty, finely-textured ham. The café also serves high tea, which I bet is a real treat. On our first night out as a large group – 10 reps from my company in all, to man our booth at the trade show and attend the accompanying conference – we dined at a Thai restaurant nestled between Amsterdam’s Chinatown and the Red Light, called Chao Praya. I wouldn’t say my knowledge of Thai food is vast. For years, I would get chicken fried rice whenever I went with friends to a Thai place, loving the cuisine’s less greasy, lighter take on the Chinese takeout staple. At Chao, D in our group ordered this, and it looked delicious indeed. I went for one of the noodle dishes, which was just average, but also an appetizer sampler that had the best darn chicken satay on it I’ve ever had. The peanut sauce was dense, complex, thick, with the tiniest whisper of sweetness, and coated the thick-cut, tender, white meat chicken rather alluringly. Yum. As I usually avoid peanut sauces due to inherent sweetness, which I don’t care for in meat dishes, I was surprised by how much I liked this, and kind of wish I had ordered pad thai for my entrée. I realize that neither chicken satay nor pad thai are necessarily the most authentic Thai dishes of which I could extol the virtues, and I welcome any readers who are also Thai food experts to educate me. Night two, I led our group on a fantastic journey of Leidsestraat’s alleys in search of Bo Cinq, a Lebanese/French restaurant recommended by our concierge. Ever since our epic feast at Zahav in August, I’ve been trying to get another taste of fantastic Israeli cuisine, and was hoping Bo Cinq would equal it. While the restaurant is lovely in atmosphere, and the service was terrific, the food here didn’t come close to Zahav’s heights. 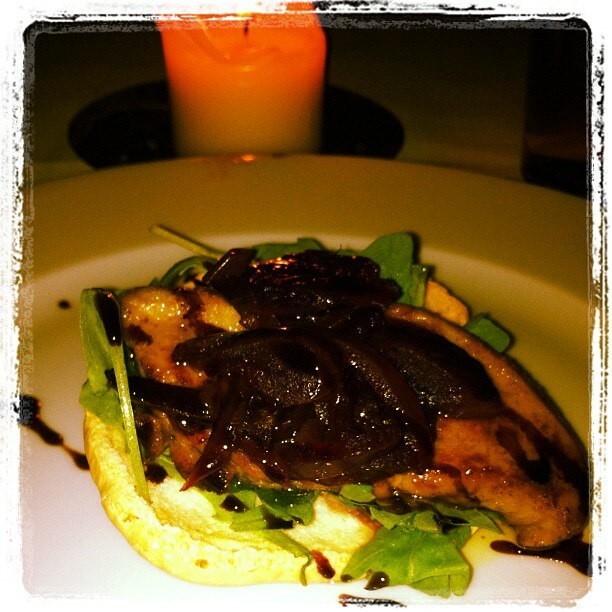 But I did have a pretty tasty duck liver with red onion compote over a thick, slightly sweet plum macaroon. If my grandmother would have been proud of all the sightseeing I did in Amsterdam, good ole grandpa would have been ecstatic that his little brown eyed girl now freely orders liver off almost any menu featuring it. 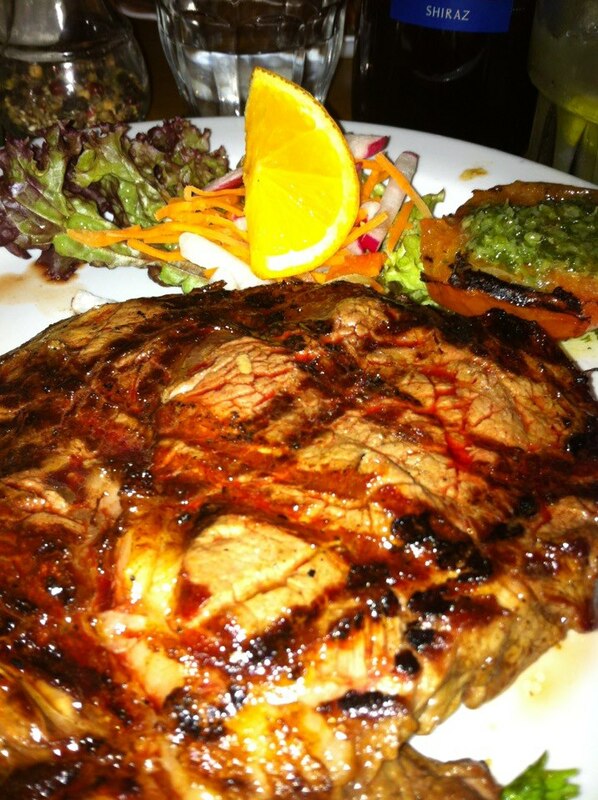 And another at Gauchos. I mean, this is some inventive restaurant-naming we have here. At both, I had tasty, juicy, well-seasoned steaks, and an odd disparity between what the establishments called chimichurri: a chunky sauce based in roasted red bell peppers, and what I would call chimichurri, which is a green, herb-based olive oil sauce. 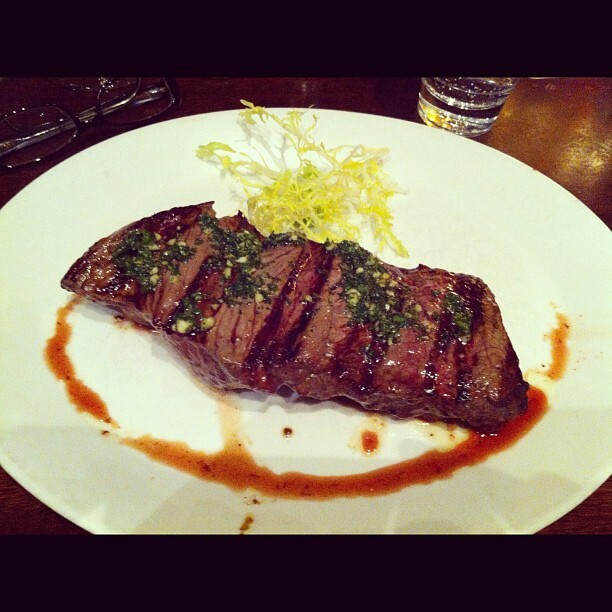 Oddly, my version of chimichurri was present on both plates – topping a broiled tomato at Ranchos, and on top of my steak at Gauchos. I felt like Alice – things kept getting curiouser and curiouser. But hey, maybe this is one of those lost in translation kind of deals. Of course, there are roughly a trillion museums in Amsterdam, not the least of which is the exhibit at the Anne Frank House. My feet were not about to put up with trudging through these after the first day’s jaunts all over the city, however, so I chose to do the Blue Boat Tour twice – once by myself, and once with colleagues. 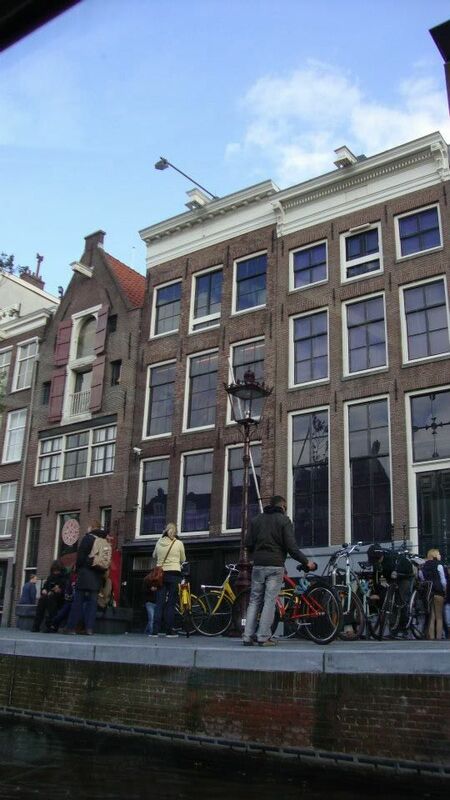 I have to say, that first canal tour was the highlight of my trip, and afforded me a view of the Anne Frank House, plus many more sights in Amsterdam than I could have ever covered on foot. If you’re more intrepid, you may want to brave renting a bike and toodling around, but please be forewarned that bikes are the main mode of transportation here. There are no helmets, and while you’ll have dedicated paths on every street and the right-of-way at all intersections, the bike traffic is absolutely staggering. Oh, and one wrong turn, you end up in the drink. So you know Amsterdammers live on the edge. This fast paced yet breathtaking city mixes bustle and beauty in equal measure, and I now understand why Grandma loved it so. Oh, and I even managed to pop in to Bourdain-recommended Febo, an automat quickie stop, for a cheese pastry that was like a grilled cheese mated with a mozzarella stick. Easy cheese goodness, for less than two euro! Thanks for the tip, Tony! My hunger is big; my personality is bigger! I would die for everything from Cafe Americain right now. Amsterdam is definitely on my To Do list. Thanks Steph! I really wish we had been able to do dinner at Cafe Americain. That place was absolutely beautiful, and the service was super old school and impeccable. It would be amazing to stay there, as well. Won't You Be My Liebster?